Well today we will discuss on the topic which is relevant to all the network engineers, It can be from Routing and Switching domain, Security domain, Service Provider domain, Collaboration domain or datacenter domain. OSI ( Open Systems interconnection model ) which actual shows the traffic flow from layer 1 till application layer. I hope you all guys know about the all layers which is described in the OSI model. Physical Layer : Physical Layer is called as Layer 1 in the networks and described all the physical media. The devices and the cables are in physical layers. All the ethernet cables, BNC connectors, Hub repeaters, network adapters are the part of the physical layers. When you connect the physical connectivities like connectivity to layer 2 switches, end hosts are in the Layer 1 connectivity. Components: Hubs, Cables, Connectors, Repeaters, BNC connectors, Network adapters. Components : Devices-router and Routing protocols except BGP are part of the Network Layer. Transport Layer : Transport layer which is also called as layer 4 in the OSI model. Transport layer tells about the delivery of the packets in the network from source to destination. It ensures the transmission of the signals in the form of 0s and 1s in the network and acknowledge about the delivery. 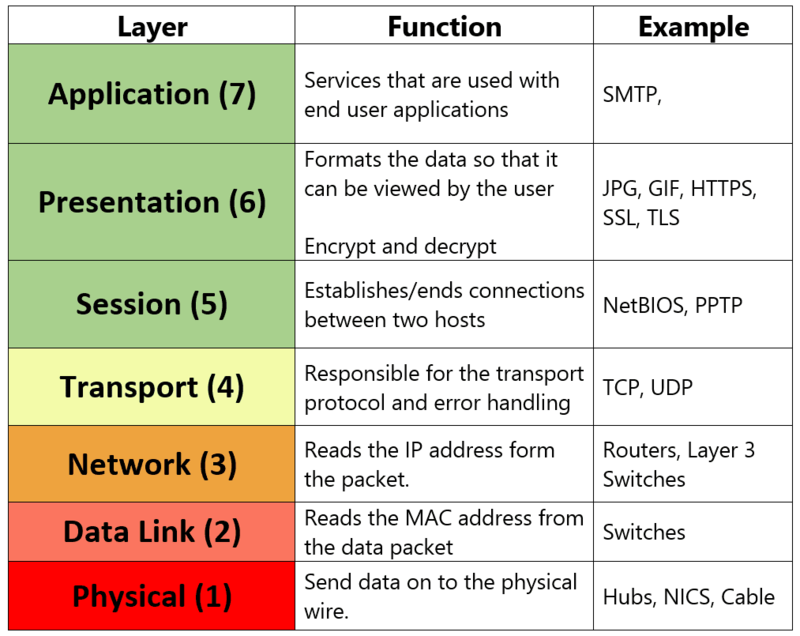 Session Layer : Session Layer is called as Layer 5 in the OSI model. this layer describes how request and reply packets are paired in a remote procedure call. The session layer or layer 5 establishes, manages and terminates the connections between the local and remote application. If we are talking about the layer 5 in the OSI model, this layer responsible for graceful close of sessions, which is a property of the Transmission Control Protocol. Presentation Layer : Presentation layer is also called as Layer 6 or the second last layer of the OSI model. The layers tells about floating point numbers can be exchanged between hosts with different math formats. The layer 5 called as presentation layer actually presentation service data units are encapsulated into session protocol data units, and passed down the TCP/IP stack.The layer 5 transforms data into the form that the application accepts.